If there's one person who knows how to make the most of an opportunity, it's 50 Cent. Now, it's your turn to step up. You've been swallowing your pride and feeling ashamed for too long. But shame has no place in where we're about to go. 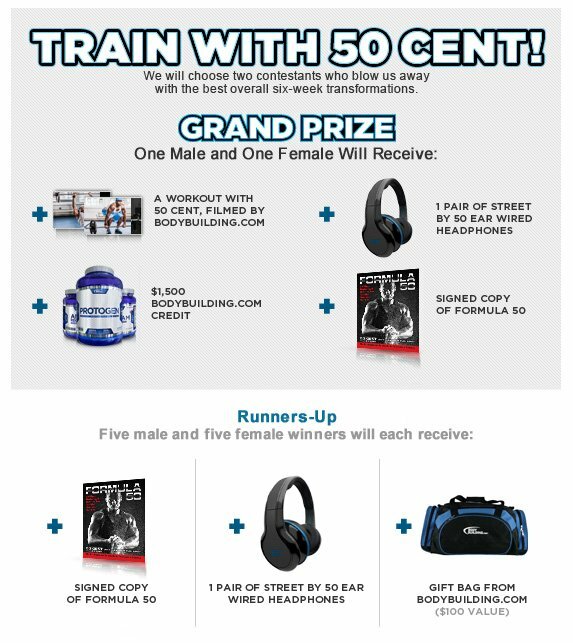 The 50 Cent "Formula 50" six-week challenge is all about sweat, determination, and consistency. Give 50 just six weeks of your best, and you can end up working out with him while the world watches on Bodybuilding.com. But make no mistake: This isn't some music video. It's your life, and you have a chance make it a better one. You can do this. Transform your body, rise to the top, and win the experience of a lifetime. We'll look for you in the gym. Q. Can I participate in multiple transformation challenges on Bodybuilding.com at the same time? Q. When does the registration period end? Q. How long do I have to transform during the Formula 50 Challenge? A. 6 weeks (42 days), starting the day you register. Q. Can I restart the Formula 50 Challenge? A. Yes. Re-registering will update your start date. Q. How will I know if I successfully registered? A. Check your email, you will receive a welcome email within minutes of successfully registering. Q. What if I didn't get the email? A. Check your email spam/junk mail folder. If you still didn't receive it, then please re-register. Q. Where and when do I upload my 'before' and 'after' photos? A. They go in the Progress Photos section of your BodySpace profile. Please upload them within 3 days of your start and end dates. All photos need to be uploaded for consideration by the cutoff date of April 14, 2013. Q. Do I need to have a newspaper in all photos? A. Yes. Please see the official Terms & Conditions for all such rules and details. Q. Who do I contact with other questions/issues? A. Email us at transform@bodybuilding.com.